I’m back again with another installment of Luck of the DRAWer box. This time around I am reviewing. I had never even heard of this character until I pulled this book out of a long box at I LIke Comics. 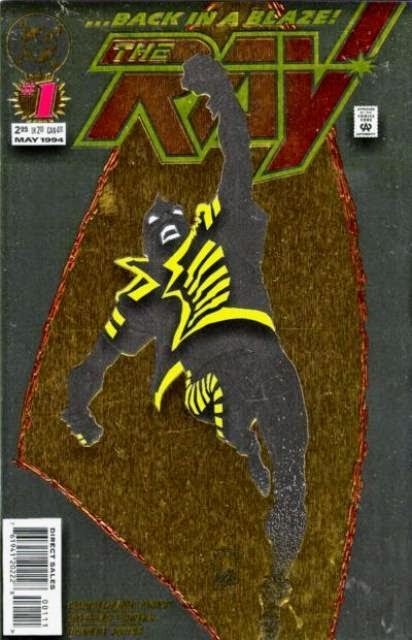 My first impression when I pulled this issue was “Oh my god it has a chromium cover.” And I know you can’t always judge a book by it’s cover, but I have had some bad experiences with the gimmick covers of the 90’s. So I have associated special covers as being just a flashy cover for a sub par book. But I read on anyways in hopes of being proven wrong. The only part of the story that redeemed it slightly was the appearance of Superboy. Though it was clear he was brought in an attempt to get more people to check it out. The Ray and Superboy banter back in forth like a couple of spoiled little school kids arguing over who’s dad could beat up who. The villain is some kind of weapon of Darkseid called Brimstone. Which from the editor notes it sounds like that was a mini event going throughout various books at the time. But I didn’t really care. The art of Howard Porter is a bright spot to the issue. Even his 90’s art shows much more talent than this book deserved. Though Ray and his cousin Hank often look identical when the panel doesn’t show their hair color. This is the first time I read a book and it was a struggle to get through it. I won’t be reading anymore of this series. It just wasn’t for me. I really was hoping to discover a new character that would catch my interest. Thanks for reading and I hope it helps to introduce more people to other interesting titles. If you have any comments or suggestions please post them on this review.